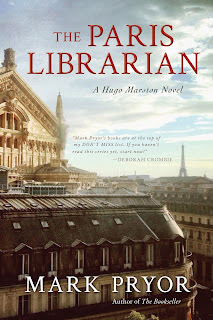 I'm delighted to be able to show off the cover art for my next Hugo Marston novel, The Paris Librarian. As you can see, it's a little different from the previous Hugo books and I absolutely love it. There are many people in my life who make it possible for me to write, people who have supported me in various ways and allowed me to act and feel like a real author. Well, thanks to them, that's what I am. There are the usual suspects, those I thank at every opportunity, like my wife and kids, my parents, my close friends. Folks like Scott Montgomery at BookPeople here in Austin, my agent and the great people at Seventh Street Books (Jill , Dan, and Jon, I'm looking at you...!). But what about the unusual suspects? I went there every weekend and some afternoons, whenever I could, to write The Bookseller. Took me about eight months and all that time I'd stroll in, nod politely to whoever was at the circulation desk, find space at a table, and get on with it. When that novel was done, I started on the sequel at the library as I waited for my agent to find me a publisher. Then, in October of 2012, the book was published and one of the first things I did was take two copies to the library manager and hand them over. "This book was written right here," I told him. "Thank you for helping me get it done." He was delighted, and admitted that they'd wondered a little about the guy who came so regularly and typed so intently. So I made the rounds and introduced myself to the other staff who were there. Most of them have moved on since but I get to know the new folks who come in, and they are always thrilled that a real-life author wrote (so far) seven novels in their library. The current WIP is also being sweated over and thumped out amid the stacks. The staff are always happy to see me, to stop for a quick chat, but they also respect my time and are plainly hesitant to interrupt -- how perfect is that? Sometimes I get to give back a little. For example, the Hoover Public Library in Alabama invited me (and half a dozen other authors) to their Southern Voices Festival. Talk about an impressive library and staff... 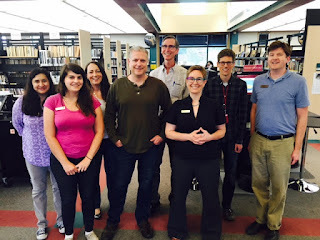 But there I was able to meet with and talk to hundreds of readers, tell them in person why I love (and need) libraries. They even filmed a chat between myself and fellow author Jamie Mason (of Three Graves Full and Monday's Lie fame). Check that out here. 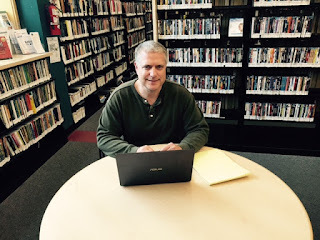 I'm sometimes asked why I write at a library, and there are several reasons. For one thing, I'm surrounded by books, and there's nothing more inspiring than that. I also like the ambient noise of the place, people murmuring and browsing the shelves, the occasional too-loud kid who's excited about this book or that video. 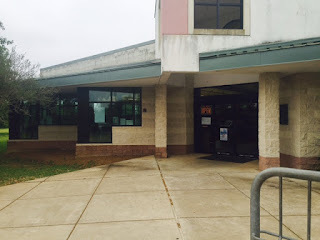 The moment I pass through those sliding glass doors a kind of peace settles over me (unless I'm returning an overdue book, then I whistle innocently and point in the opposite direction as I drop it in the return slot). I'll be back there this Friday, on most Fridays in fact, it's as close to an office as this writer has. But it's not your usual office - the commute is five minutes, the welcome is genuine and warm, the hours are short, and I get a ton done. 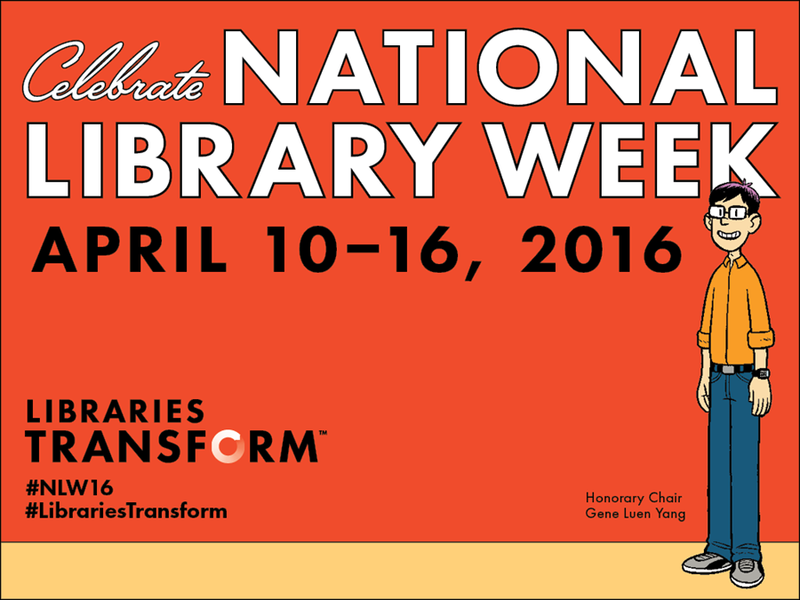 So thank you to my friends at the Hampton Library. 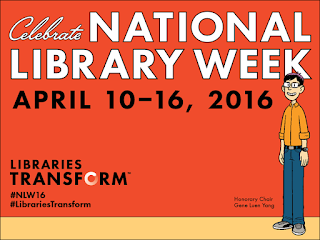 And thank you to all the librarians out there, you probably have no idea how much we writers need and adore you. Congratulations, Mark. Can't wait to read more Hugo! I've just got my Hollow Man to read.